We have kicked off our planting season in the Demonstration Garden with work days the last two weeks. We went from a garden that was full of volunteer wheat and cheat to a garden that had the beginnings of our plans implemented for the season. As you can see, the weeds/grass and leftover plants from last year were having a field day. This picture actually looks better than it would have a day previously, as the Compost Committee graciously pulled the weeds and spread compost in Bed 4! Here’s the “After” shot from yesterday. We removed the old hops vines, most of the other dead plants and all the weeds. We added a whole bunch of compost to the beds that needed it, and got started with planting. The Colonial Garden is probably the farthest ahead in the planting game, as the vast majority of the plants in this garden are spring/fall (cool season) veggies. We transplanted three types of lettuce that Thomas Jefferson had records of planting, as well as two heirloom cabbage varieties and an heirloom, vining pea. We also planted both parsnip and salsify seeds. The Accessible planters are largely planted already with spring crops. These planters will have a mixture of kale, chard, sprouting broccoli, spinach, lettuces, radishes, and peas for the spring. We will have a couple tomatoes later on, but again, lots of spring/fall crops. One of the most interesting things in the early spring planting is this kale mix. It is called Kale Storm Mix, and we planted it in several of the containers. This is a multi-seed pellet, sometimes called a “fuseable.” They’ve been around the flower industry for a few years, but this is the first time I’ve seen them for veggies. The seed company took 3 kale varieties and mixed the seeds in a uniform ratio and put them into these larger “seed pellets.” The result is supposed to be an evenly mixed, visually attractive blend of kale. We’ll see how it turns out! The ‘Cascade’ Hops is also an interesting experience. Last year I was afraid it wasn’t going to do much for the longest time. Then it did finally take off and grow. This year it is already half way up the cage before April 1st! Yikes! Another fun factoid: hops shoots are edible like asparagus. We tried nibbling on them, and they do taste like asparagus at first. But then there is a really nasty bitter aftertaste. Ugh! There’s a reason hops are not grown for spring edible shoots! This has been a busy week, because we also got all our tomato and pepper seeds started inside. I don’t have any pictures of the plants yet, but I’m sure you can go back into the blog archives if you want to get the idea! And just in case you were curious, I’m not planning on planting my tomatoes any earlier than usual – at this point. It’s cold today, and there’s a lot of weather to come before it is tomato planting time! I am already starting to switch gears into thinking about ideas for next year’s garden, but I wanted to wrap up a few thoughts on the vegetables we had in our Oriental Garden this year. We had a wide range of things, and some of them (literally) overshadowed the others. The okra started off to an inauspicious start with poorer germination that I would have wished for, but the plants grew so well that we didn’t want more of them. They were relatively naturally bushy and had a good yield. The variety was touted as being non-fibrous at larger sizes and this seemed to be the case. The long, Asian varieties of eggplant seem to always yield well, and this variety was no exception. The skin was tender and the flavor good. These plants were productive for the whole summer and into the fall. Once we actually got around to trying out the sauteing recipe that is traditional, we all regretted not using them more all year long! This eggplant was good and relatively productive, but it got overgrown by the nearby okra, so it wasn’t as productive as it otherwise might have been. This salad turnip was a solid performer in the spring planting. Oriental cucumbers typically have good flavor and productivity. This variety was good in the early part of the season, but the plants didn’t last very long. It’s hard to say if that was due to competition with the other vines or a varietal characteristic. This new mizuna variety had purple veins and stems. It did what it was supposed to, but what put it above others is how long it lasted into the summer before bolting. These mustards have been around for awhile and we’ve grown them before. They did what they were expected to do, although they bolted a bit earlier than I would have preferred. The seeds failed to germinate, which may be a fault of the seed source, not the variety. As with any other Asian melon we have tried, they are very different from what Americans expect of a melon. The plants were fairly productive, although we did have some cracking of the fruit. The flavor of the melons was not as good as some other Asian melons I’ve tried. The hardest thing with a Chinese broccoli is harvesting it fast enough to have good quality and yield. I would have to try some other varieties side by side with this one to judge well, but it seemed like these bolted very fast. We’ve grown long beans in the past that have been highly productive, so these were a disappointment. We had hardly any harvest, compared to past experiences. This celery is more of an herb than the big stalks we are used to. It never got very big, but it also didn’t die or bolt like I thought it would. If I’m honest, I kind of ignored it. It would be worth trying again sometime. We struggled with germination, then the plants just sat there for the longest time. Eventually a couple did grow (after we had given up and planted the long beans in the same spot). We had a handful of beans to pick, but that was it. The luffa vine took over everything, but either it was such long days to maturity or it was day length sensitive, because it didn’t bloom until late September/early October. It did set a few fruit, which would have been fine for fresh eating. (Yes, you can eat fresh luffa gourd like zucchini.) However, it had no chance of reaching sponge stage. What’s Up with the Gingers? The raised bed that had the ginger family plants really did pretty well by the end of the season. They typically take longer than one growing season to produce mature rhizomes, so we decided to dig them up and save them for next year. The plants all grew well this year, once they were established. The cardamom was by far the smallest, shown here in the very front. When the nights started getting down into the 40s, we decided to pot them up. We tried to dig up a large root area to keep them growing well. We moved them into my office under my light stand. 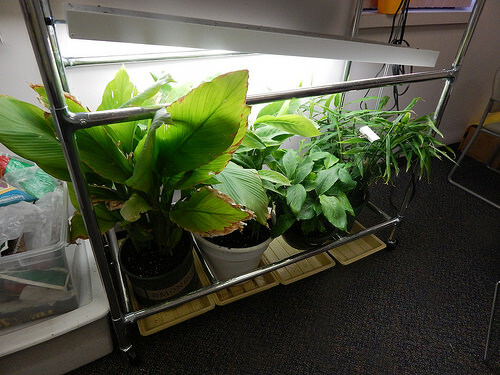 Unfortunately, I had to trim the three larger plants back a bit to fit them under my lights. I don’t think this will be an option next fall. I did pull off a piece of each of the three edible rhizomes. (The cardamom has small rhizomes. The spice part is the seed pod. This takes about 3 years to develop.) 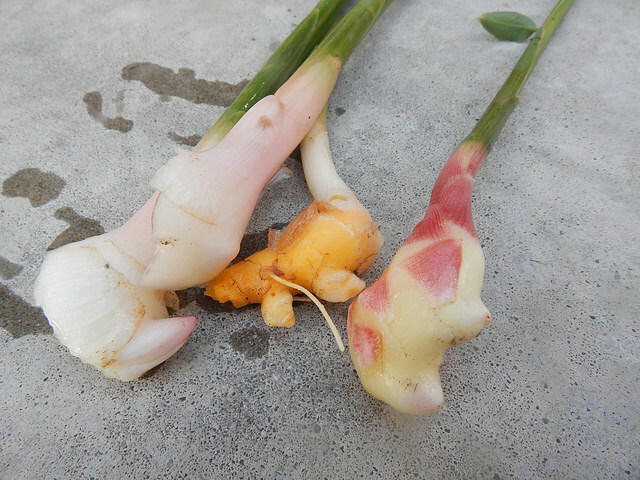 The light pink rhizome on the left is the greater galangal. 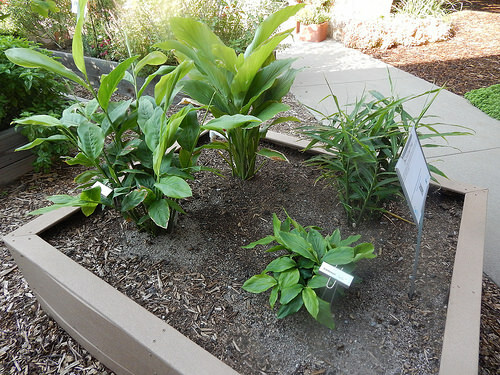 The center rhizome is turmeric, and the right rhizome is the ginger. Technically, all of the rhizomes could be used at this stage, before they develop the fibrousness and skin typical of the mature root. They are crispy, succulent, and fragrant at this stage. Of course, they wouldn’t last long without the skins. You could also regenerate the plant from these pieces. Each of the little nodules or pointy nodes you can see on the rhizomes will grow a new shoot. The plan for now is to keep the plants alive for the winter. Or, at a minimum, keep enough of the rhizomes alive to regrow next year!